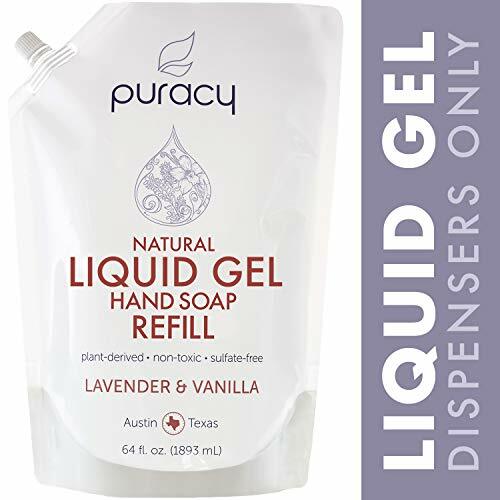 Puracy Natural Liquid Hand Soap Refill (for liquid dispensers, only) is a plant-powered liquid hand wash with a thick, honey-like consistency. It produces luxurious foam and feels gentle throughout the hand washing experience, yet still removes dirt, oils, residues, foods, and other contaminants. This doctor developed blend has a perfect balance of safe cleaners and vegetable-based skin moisturizers. The lavender and vanilla scent is from real essential oils and provides a gentle, balanced aroma throughout its use and then quickly disappears. The 64-ounce refill pouch contains enough concentrated soap to clean over 3000 hands. With such pure ingredients, we guarantee it to never clog your soap dispenser. The biodegradable ingredients were carefully chosen and developed into a premium solution by Puracy, a trusted source for all natural, plant-based, child and pet safe, hypoallergenic, and effective household essentials. This product is 99.95 percent Natural, per Puracy's 'What Natural Means to Us' definition available on our website. The proprietary blend of renewable ingredients is safe to use around your family and does not contain harsh chemicals and fumes. The unique formula leaves no residues and provides a subtle aroma of lavender and vanilla. Our hand soap is tough enough for grease, gentle enough for children, and pure enough to naturally recycle in the environment. 100% SATISFACTION GUARANTEED: Natural, non-toxic, hypoallergenic, vegan, gluten-free, biodegradable; Certified Cruelty-Free: Never Tested on Animals; Made in the USA!